Infrared Sauna and Rosacea - Can it Really Work? What is the story about infrared sauna and rosacea? If you have rosacea, you are familiar with the insensitive remarks and inappropriate questions. People feel it is acceptable behavior to ask, “What’s the matter with your skin?” You have probably seen people stare and heard people whisper as you walk by. You have also probably endured people reacting to you as if your rosacea is contagious and comments about your flushed, red skin being a result of heavy drinking. It makes living with rosacea that much harder. You have also probably tried every type of cream, ointment, pill and diet change to alleviate your skin condition. Even if you don’t like using make-up, you’ve probably also tried to conceal it by slathering on a ton of cosmetics. There is something you should know though, and that is about the connection of the infrared sauna and rosacea. There have been some rosacea sufferers who have reported noticing a positive response by using an infrared sauna. The idea of an infrared sauna and rosacea may sound counterintuitive since rosacea usually reacts quite poorly to heat. The thing to understand is that an infrared sauna is much different than general saunas, the ones you may be familiar with that are heat producing. 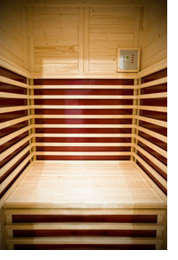 Infrared saunas do produce some heat but their levels are generally much lower. Plus, they offer the benefit of being anti-inflammatory. Possibly, because of this, some people who are struggling with the flushed, red skin condition find infrared saunas and rosacea can work well together. Some find these types of saunas actually seem to help with their rosacea. The key factor in using infrared saunas for rosacea is to be non-aggressive. This means monitoring the amount of time your session in a sauna is and taking care to be mindful that you use a lower heat level. Certain microbiologists, who are experts in the field of rosacea or conditions of the skin, suggest that people with rosacea might have a huge excess of fat soluble porphyrins in their skin, making skin dry, irritated and easily damaged. The theory of the link between infrared saunas and rosacea is that it may enable a sufferer to basically sweat it out. In other words, the infrared sauna would cause the person to sweat out, or at least release to the excretory system, and release the fat soluble porphyrins in the skin. The end result would be relief from some of the symptoms of secondary porphyria. There have also been reports that claim there are other reasons infrared saunas and rosacea may work well together, such as the dilation of blood vessels that cause a general flushing. Infrared saunas are known for their ability to increase and improve blood circulation. In cases of people struggling with rosacea it has been stated that increased micro-circulation and blood flow aid in the body’s ability to release toxins, therefore alleviating some of the symptoms of the condition. What you should realize is that the heat produced in an infrared sauna differs from other saunas and heat producing agents in general. While inside an infrared sauna, your skin does not seem to heat up so much from the outside as if heat is being applied to your skin. The “heat” is more like a sensation that grows like a warmth generated from below the surface. It is like sitting comfortably in a warm glow as opposed to suffering through extreme heat exposure. It is a pleasant experience and you will see how nice it feels. You will also begin to understand how using infrared saunas can easily work to be beneficial to those who suffer from other conditions like inflammation or fibromyalgia. People have also used infrared saunas as part of a treatment plan for other skin conditions such as acne, eczema and even varicose veins. In fact, these saunas have also worked as treatments for other health issues like osteoarthritis, rheumatoid arthritis, heart disease and many other ailments. You should be aware, though, that there have been reports from several sources that you could experience a period of additional rashes in the initial stages of your use of infrared sauna and rosacea. For some conditions, you have to get a little bit worse before you can get better. When your system is purging, more toxins released to the skin can result in breakouts. These reports mention that healing reactions are merely temporary symptoms that arise as toxic substances are eliminated and chronic infections heal. You should talk to your doctor before starting this or any type of treatment for your rosacea. Most importantly, you should monitor your own reactions and progress while trying an infrared sauna and rosacea combination. You now know you may see some increase in flushness at first but that this should hopefully be temporary. More reading on infrared sauna and rosacea.